A large crowd enjoyed Rossini’s “Barber of Seville” in the expansive Our Lady of Perpetual Help school auditorium on Sunday. Debut artist Augusta Caso was simply magnificent as Rosina, with incredible vocal decorations; her acting was so believable and she very much looked the part of a gorgeous ward of Dr. Bartolo, played by John Schenkel. Schenkel is Regina Opera’s ever-faithful bass and he delivered a truly memorable characterization. David Williams, also in his debut as “Figaro,” the “Barber,” was still another high point in this stellar cast. His performance of rapid passages was like lightening. He, too, was a remarkable singing-actor, and the ensemble made this comedy come alive. 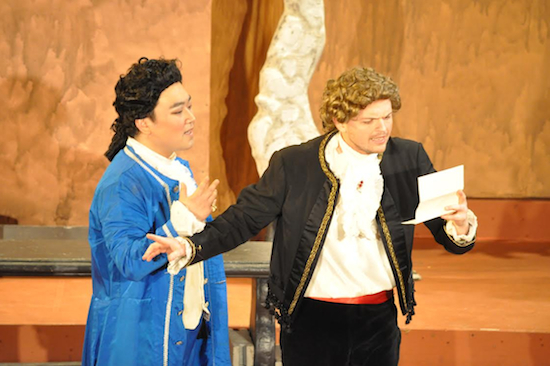 Sungwook Kim served as Count Almaviva and numerous other disguised characters. Kim has a beautiful voice and excelled in Acts II & III. His “Gioa e Pace” was a real comedic success. Also outstanding was Jonathan Dauerman as Don Basilio, the music teacher. Dauerman brought the audience to wild laughter with his portrayal. Christa Hylton also brought down the house in her role as the drunken servant Berta. Also in the cast were Nicolas Connolly as Fiorello, Hector Mori as an officer and Thomas Geib as the Notary. Conductor Dmitry Glivinskiy deserves the title of “maestro”- teacher for his skillful conducting and playing of the keyboard for dialogue sections at the same time. Glivinskiy was also making his debut and the Regina orchestra and chorus were splendid under his direction. A May production of “Carmen” is planned.